Pulkovo Airport in St Petersburg provides a critical gateway into Russia. It is one of Europe’s most ambitious aviation projects to date with a landmark terminal and surrounding airport ‘city’ designed to double passenger capacity to 17 million a year by the end of 2015. Pulkovo is Russia’s fourth largest airport, after the three major airports in Moscow. However, by 2007 the airport had been close to maximum capacity for several years, so an international competition was launched to design a landmark terminal with surrounding airport ‘city’. The ambitious project set out to double passenger capacity to 17 million a year by the end of 2015 from around 7 million in 2008. In 2008 a €1bn development programme was announced (the first public private partnership in Russia) to fund the airport’s growth to over 100,000m2 to accommodate the increase in annual passenger capacities. Work began on Pulkovo Airport in March 2008 after the Northern Capital Gateway Consortium (NCG) was awarded a 30-year concession to deliver Grimshaw’s winning architectural concept. Ramboll was appointed as the lead design consultant (via project teams in Russia, UK, Denmark and Sweden) and Pascall + Watson providing architectural design. The teams at NCG and Ramboll did not delay initiating Phase 1 of the reconstruction project given the main terminal building had to be complete and open by 1st January 2014, with all works being completed by 2016 - all whilst keeping the existing Pulkovo Airport fully functioning. Passenger Terminal Facilities including building a new three storey international main terminal and passenger pier totalling 150,000m2. and the refurbishment of Pulkovo 1 - the existing domestic terminal building. Airside Facilities including the overhaul of existing airside infrastructure as well as large expansions and operation improvements including as taxiways, the fire station, road system, doubling the apron size, a new cargo apron, maintenance facilities and a wastewater treatment plant. Landside Facilities including a two-storey arrivals forecourt, car-parking, warehousing and administrative support facilities and commercial developments (such as a hotel, business centre, offices). 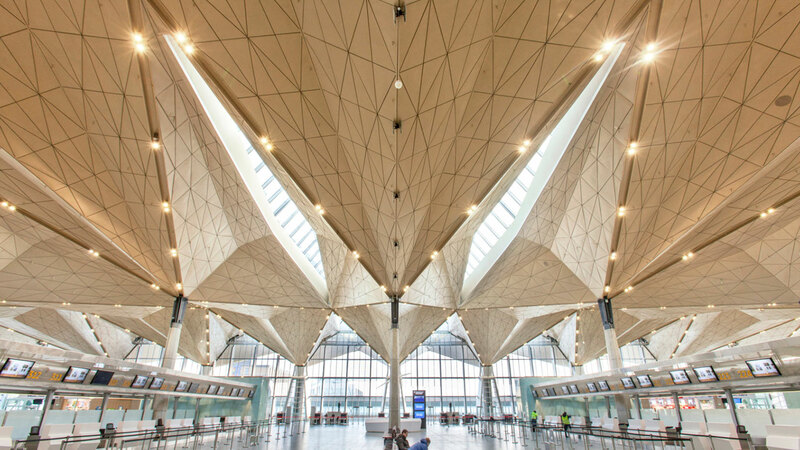 Ramboll’s mission was to engineer the design of Pulkovo to realise Grimshaw Architects ambitious vision for the airport in the most efficient and effective way. This was to be done within the tight timescale set by the client and the need to maximise flexibility to enable further development in the future so the airport can grow with the passenger numbers. Ramboll’s international team was able to integrate local knowledge of the approvals process and client’s requirements, with delivery options and constraints. Grimshaw’s striking architectural concept was realised using innovative modelling techniques enabling fine tuning of the roof geometry and members, resulting in significant steel tonnage savings. Multidisciplinary solution- We formed a team including structural, civil, MEP, façade and geotechnical engineers, as well as acousticians, fire and safety experts, sustainability and environmental specialists and project managers. And to deliver the very best blend of expertise the team included global experts from across the UK, Denmark and Sweden, as well as resource in Russia. “The client wanted to create a landmark terminal placing strong emphasis on design. Grimshaw Architects developed the initial competition winning concept which NCG, Ramboll and Pascall + Watson have developed and brought to life. The design put the passenger experience at its core and looks to create views over St Petersburg and celebrate arrivals into Pulkovo. The design therefore draws on the architecture of the city of St Petersburg with large glazed facades. A striking long span-roof forms focal points of the design. The floor plate concept reflects the processing in the airport, with areas connected by elevated walkways to reflect and celebrate the character of the City of island and bridges. The show-piece of Grimshaw’s competition winning scheme for Pulkovo is the gilded folded soffit of the long-span roof with expansive roof lights free from structure, raised from the ground by 25m high columns. To optimise this unique roof profile, Ramboll used physical and parametric modelling to optimise the 12,000 roof steel members. The parametric model shown in the attached video tests a variety of truss dimensions and framing options and a wide range of potential soffit geometries. The structural elements were optimised to Russian and European codes in parallel. This lead to the development of bespoke programs and advanced analysis techniques, which were combined with snow drift modelling in a wind tunnel. The reward for developing these new techniques on a project of this scale is that small refinements in structural efficiency resulted in a big reduction in overall roof steel tonnage and major building cost savings. The 270m x 162m roof is free from movement joints due to a star truss arrangement, which is supported from bridge bearings at the tip of each column. This innovative solution accommodates movement under a huge 70°C external temperature range, which is unique for a structure of this scale. Ramboll also used complex finite element models to analyse various loading scenarios, including the behaviour of the roof after a local member fails using a load step analysis. The Buckling Element Model shown in the attached video, proved that our star truss arrangement was a very robust solution as we could continue to increase the load well beyond the design loads until we reached global collapse. St. Petersburg can pride itself on a new airport terminal, which can rival the best of airport terminals across Europe in terms of energy efficiency. A bespoke BREEAM assessment tool was developed to ensure that an inherent sustainable design ethos was applied to the project. Energy saving techniques including heat recovery and daylight linked digital lighting controls are examples of some of the many carbon reduction measures incorporated into the building. Explore the links below to discover more about the various aspects of this fascinating scheme.